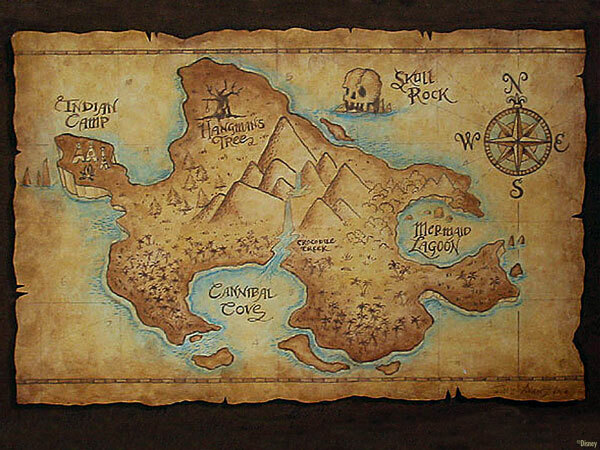 whenever i think about a pirate story, i think about maps. old maps, drawn with ink on parchment, with unknown places illustrated fancifully. a map is necessary for many kinds of stories, and this story is rapidly approaching the fantasy genre, which would in fact require a map. but not a regular historical map. i want a fantastic caribbean, something in between what sailors knew about the waters they sailed in in the 16th and 17th centuries, and what we know now with google earth and disney animation. so i was reading michael crichton’s posthumous novel about pirates, and it has a nice map of the caribbean in the endpaper. i was thinking about drawing the negative space of the map, that is, drawing the water, and doing strange things with the features of the area, like number and placement of islands. my mind began to work, and for several days i’ve been obsessed with the caribbean, even to the point of looking at real estate in the tropics. i also admit to a certain fascination with google earth, and have been spending a lot of time cruising around looking at shorelines and natural ports (and never mind the cities that have grown up around every one). 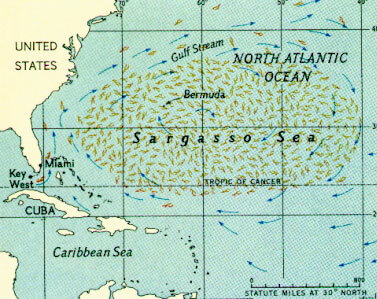 the sargasso sea, where since the middle ages there’ve been tales of ships lost and ghost ships. yes, way before the same region became knows as the bermuda triangle. gotta have that, just thought i’d put it in while i was thinking about it. 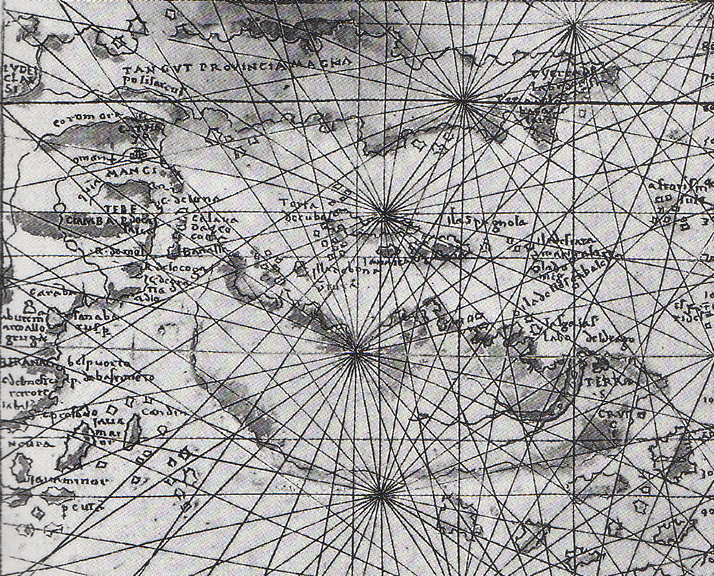 this is an early map (early 1500s) showing the caribbean islands all out of proportion to their actual size, but reflecting the importance to the early explorers. they knew of rich lands to the south of the islands (quick thinking on the part of the natives) and to the west, but at this point they still thought china was just over the horizon. i like this map because it doesn’t show anything beyond the coast of south america. 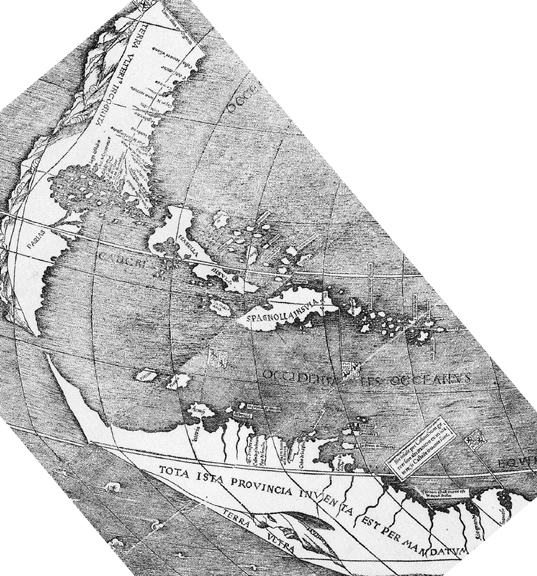 hispaniola is the center of this area, and altho they’ve got the coast of venezuela, colombia, panama, and on up into the gulf and then up the eastern seaboard, these are all sketchy details, as if the islands were the important feature of this particular universe. this one also shows huge islands and tiny continents. 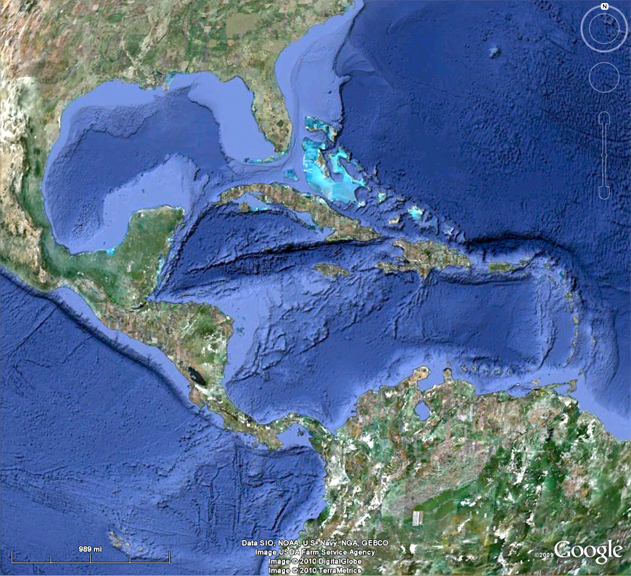 look, you can see both right and left coasts of the u.s.
and these days, who can do without google earth? even movies are using it, the news, the weather, kids’ films. yay. wish i’d bought google stock back in the day. 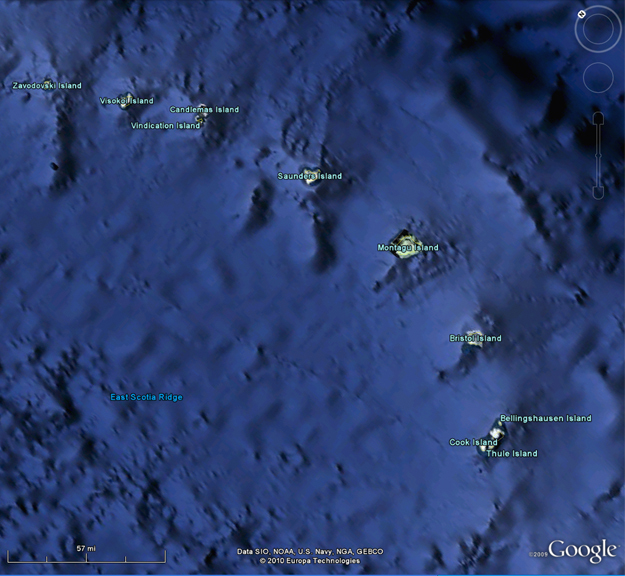 so i’m like sitting on google earth looking at my caribbean, where my pirate novel will be set. and i’m thinking that the caribbean that’s sticking in my mind, my dream caribbean, if you will, the caribbean i would go hang out in while dreaming at night. my caribbean is more like the old maps, where you don’t care what’s past the coast, and all you’re really interested in is the island chain, and the places you can get to by boat. now, i’ve got to say i’ve always been interested in antarctica, too. i wanted to go on the nsf artist and writer’s residency, boy oh boy, but because i’m totally unknown as an artist, and because i’ve had cancer, they wouldn’t want to approve my application, so i just haven’t bothered. but that doesn’t mean i haven’t spent a great deal of time fantasizing about it. i blame kim stanley robinson. at the equator and spin the google planet around on its axis running thru loads of other-than-traditional pairs of points. like, i could make the north pole run thru the northeastern part of the united states. i could make the middle east the south pole. politically, that would tend to stifle the energies of these rather warlike countries. as would putting europe flat on the equator stifle their energies. cultures do better, speaking economically, industrially, when they’re in the mid latitudes, around 40-60 degrees. so in order to have anything much happen to antarctica, you’d have to physically move it into at least the temperate zones. i’m just saying. when you strip off all the ice, you get a nice little group of islands, rather than a continent. the northwestern arm is the antarctic peninsula, and adjoins the tip of south america. look at those adorable bays and those fierce mountains. wouldn’t this make a great map for a fantasy novel? and when you add the islands that lie outside the antarctic landmass(es), you get a nice bunch of really great islands that absolutely nobody lives on now except for a few shepherds and a military outpost or two. the south shetlands are so near to the antarctic peninsula as to be part of it, so of course nobody lives there. at the moment it’s cold and stormy most of the time. penguins and climatologists. the south orkneys are a little balmier, the south sandwich islands are warmer still, and then there’s south georgiaand the falklands where people actually live. i like the idea of putting antarctica in the tropics. there’s this cool archipelago between the antarctic peninsula and the tip of south america, called the scotia sea. it curves out and around, and makes a nice basin, fringed with islands. and this is the scotia sea basin. you can see the falkland islands plainly, the south orkneys are the white slash to the east, at the beginning of the curve south. the south sandwich islands are along the easternmost curve of the chain, and running along the southern edge to the west are the south shetlands. altogether a lovely bunch of islands. and in case you missed my point, i find these two areas to be quite similar. so, what would happen if a comet hit the earth and put the scotia sea at about 20 north latitude, and what if it dried up alot of the oceans’ water, whereupon the landmass south of the scotia sea would rise up and become continental, and the landbridge between south america and antarctica would emerge. you wouldn’t believe how much like the pacific northwest the pacific southwest looks. there. a bunch of islands, wonderful places for piracy. and it would be awhile before civilization got to that point, and with similar scientific and technical advances. what a great idea for a book. copyright 2010. Posted on February 19, 2010, in antarctica, characters, pirate, research and tagged antarctica, caribbean sea, map, pirate novel, south sandwich islands. Bookmark the permalink. Leave a comment.